BOSTON | The two-time Boston Marathon champion turned onto Boylston Street with a sliver of a lead, leaning in front of two others with the finish line in sight. And he needed every bit of his speed. 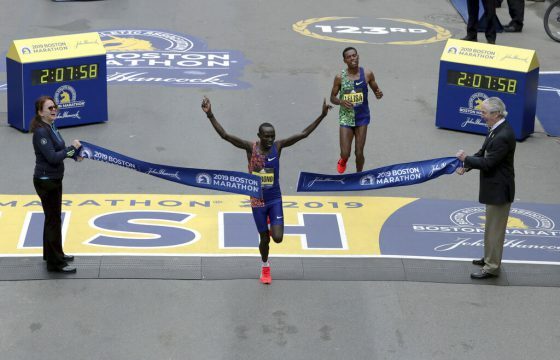 Cherono outkicked Lelisa Desisa and passed him just steps away from the tape, winning the 123rd Boston Marathon in 2 hours, 7 minutes 57 seconds on Monday to claim his first major victory. Desisa, the Ethiopian who won the 2013 race that was marred by the finish line bombing and claimed a second victory in ’15, eased up after realizing he was beaten and finished 2 seconds back. Kenneth Kipkemoi was third, another 8 seconds behind, one of seven Kenyans in the top 10.